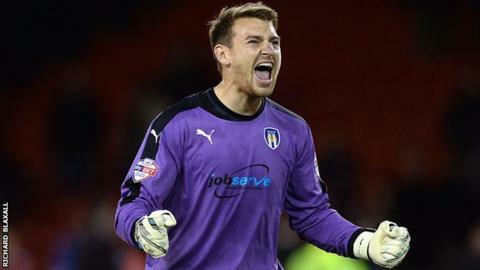 Colchester manager Tony Humes has praised goalkeeper Jamie Jones after he saved a penalty to help his side to victory for the second straight match. After keeping out a spot-kick in Tuesday's 3-2 win at Sheffield United, Jones saved Cody McDonald's effort in Saturday's 2-1 defeat of Gillingham. "You can say he won the game for us. It gives the back four a lot of confidence with him doing that," Humes said. "The more he saves the more pressure's on the penalty-taker in games to come." He added to BBC Essex: "But it's not just that part of his game; he's very calm, he talks to the back four very well and I think he's a great acquisition for us." Jones joined the U's from Preston on a 93-day loan on 11 September and in the three games since Colchester have taken seven points from a possible nine. That included Saturday's victory over the Gills, who had topped the League One table before the match. But Humes says his 13th-placed side cannot begin to get carried away, having only avoided relegation on the final day last season. "We're growing. We knew we had to bring players in and they take time to gel," he said. "Don't get carried away with it because, like we said a few weeks ago when we only had three points, there's an awful long way to go. "But it's a nice feeling to get the first home win on the back of a fantastic win at Sheffield United. We'll keep growing in confidence and if we dig in that way we'll be a difficult side to play against this season."